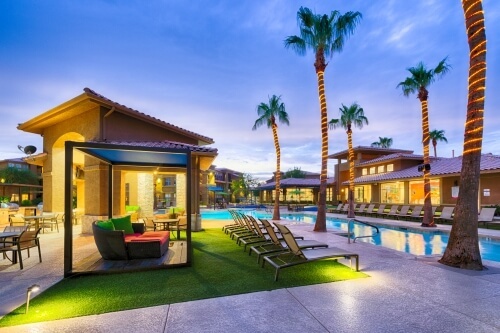 Gateway at Tempe is a 288-unit class A student housing community serving Arizona State University in Tempe, Arizona. The property is located on University Drive, only one mile from campus and is conveniently located near numerous employment, commercial and entertainment venues. Arizona State University is one of the largest tier 1 universities in the country, serving over 76,000 students in total with 62,000 attending the Tempe campus. Gateway at Tempe was developed in 1997 as purpose-built student housing. The property consists of 288 units and 918 beds ranging from 477 square foot one bedrooms to 1320 square foot four bedroom floor plans. Amenities include: clubhouse, resort-style pool with sundeck, hot tub, outdoor fireplace, study lounge, fitness facility, basketball court, tennis courts, bike racks and barbeque grills. Each floorplan is fully furnished with leather-style furniture, private bathrooms, full size washer and dryer, and built-in entertainment center. An extensive property enhancement program will begin shortly after acquisition and will focus on expanding and improving the community amenity package as well as unit upgrades.